This is a strange mixture of a VCO and a switched capacitor filter based on the filter presented by Jan Hall in Electronotes. If you are after something different, this fits the bill. After all, how many filters have a sync input? This filter is based on the original idea by Jan Hall, as presented in Electronotes EN92 P14-15, which was in turn based on an idea in a 1974 issue of Electronic Design on a Biquart (twice the order) filter. A VCO drives a pair of analog switches, switching two banks of eight 0.047uF (47nF) capacitors across op-amps (effectively creating multiple integrators), and this a multi-passband or comb filter is created at f0, f1, f2 etc.. The overall filter configuration itself should be easily recognized. Two controls are provided within the structure of the filter - damping and bandwidth. Not all combinations of these two are actually valid, some resulting in silence, but none the less, quite an array of variations is possible. The VCO section has been re-vamped, based on the well known Electronotes ENS-76 VCO Option 1 as used in the ASM-1, Modulus, etc. This core was an obvious choice due to the amount of information, lists of suitable substitutes and so on that are available on the web. In this case, a cut-down version is used as its purpose was simply to drive the analog switches. The VCO is connected via a signal processor to the input of a 4024 binary counter. The first three divisions are used to drive the address lines of the 4051 analog switches. While not shown on the circuit diagram, the remaining divider outputs are also available. They are not buffered, and are thus not suitable for connection to panel jacks, but they can be wired to a rotary switch, followed by a level pot, and fed back into the input of the filter itself, thus giving the filter an excitation signal that is perfectly in sync with its operating frequency. When configured like this, the filter becomes a very unusual oscillator giving quite complex, waveforms or even simple waveform sequences (ringing bursts). The component overlay for the REV1.4 PCB. There is a 47pF marked on the PCB at the point shown in magenta. Do NOT install it. Despite there being SMT pads on the rear of the PCB, no SMT parts are required. The component overlay and basic wiring for the Bi-N-Tic Filter. All pots are viewed from the rear. It is of course possible to add level pots to the CV and signal inputs. There are pads supplied for an optional second signal input and second output. Additional CV inputs may be added through additional resistors to the CVSN (Control Voltage Summing Node) pad. The optional wiring for the Bi-N-Tic Filter: The lower divisor outputs of the 4024 are selected via positions 2 to 5 of a rotary switch. Position 1 is the optional Input 2 jack. The output of the switch is fed via a level pot to the second signal input on the PCB. Positions 2 to 5 of the rotary switch now provide four signals, one octave apart, to "excite" the the filter when it is adjusted to be near resonant, or if the filter is backed off, four octaves of square wave VCO output. 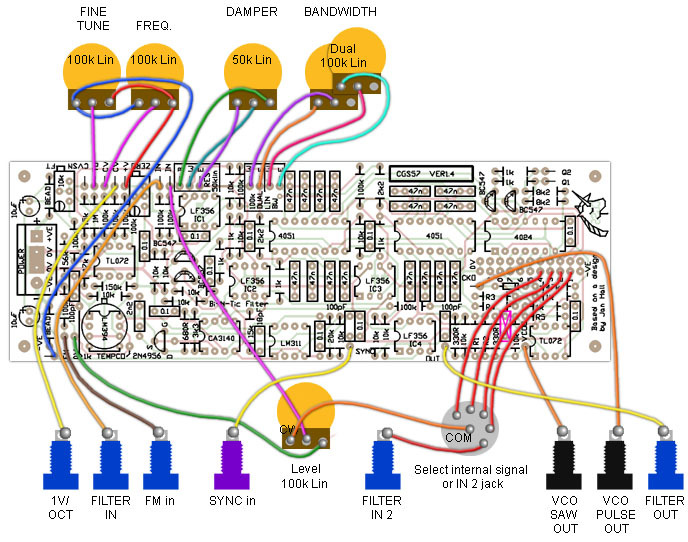 There are also direct sawtooth and pulse outputs from the VCO. While LF356 op-amps have been specified, any single op-amp should be suitable. TL071, TL081 etc. certainly work in the circuit. Do not install the 47pF capacitor. Despite there being surface mount pads on the rear of the PCB, no surface mount components are required. Some people find that "near enough is good enough" for filter tuning. In this case, the PT146 tempco resistor can be replaced with an ordinary 1k resistor, and the LM394 replaced with a pair of NPN transistors such as BC547 or 2N3904 (preferably matched). The module will work on +/-12 volts if the 20k resistor (connected to pin 3 of the LM311) is reduced to 14k.